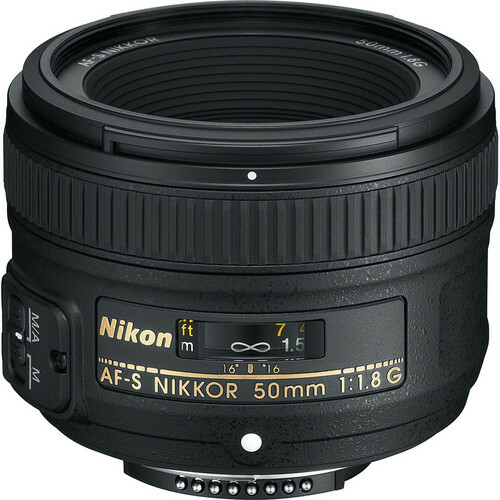 A FX format 50mm prime lens, the AF-S NIKKOR 50mm f/1.8G is a great lens to have at a price of only $220. Nikon’ SWM (Silent Wave Motor) technology makes the lens very quiet when auto-focusing. M/A technology enable manual overriding of the AF feature just by turning the focusing ring even when the lens is trying to auto-focus. AS or Aspherical elements in the lens along with the Super Integrated Coating (SIC) technology ensures that the lens has reduced flares, ghosts and higher color saturation. An f/1.8 wide aperture makes the lens extremely fast and ideal for shooting in low light conditions, indoors, weddings etc. Additionally a wide aperture helps in the creation of soft blurred background around the subject. The lens has a minimum focusing distance of 1.48’ or (0.45 meters). The lens has a maximum viewing angle of 31°30′ on a DX format lens and a maximum viewing angle of 47° on a FX format. There are a total of 7 lens elements arranged in 6 groups. The lens diaphragm is made of 7 blades. The filter size specification of the lens is 58mm. the dimensions of the lens are 2.8×2.1” (diameter x length). The overall weight of the lens is 185 grams.